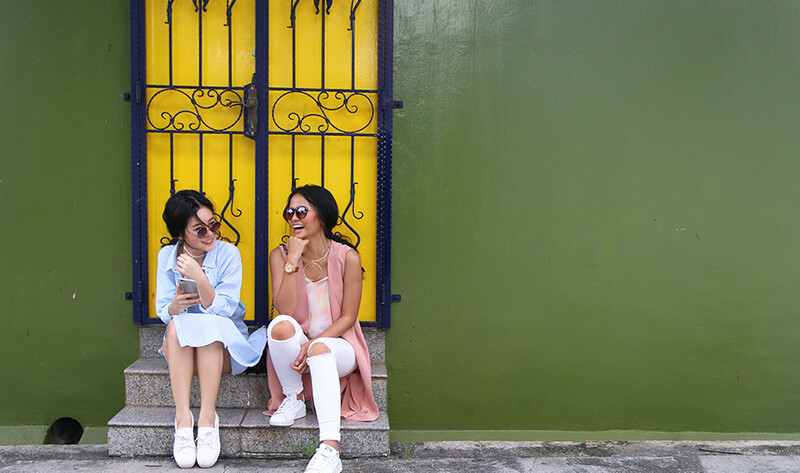 After a massive scouring of the island for Singapore’s most Instagram-worthy spots, we’ve scaled down our search to distinctive neighbourhoods. 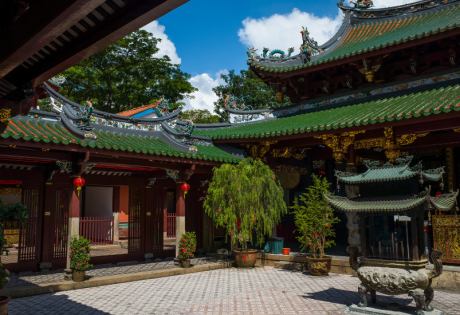 Top of our list is the Eastern district of Joo Chiat – this heritage-rich ‘hood is more than just foodie heaven; it’s packed with charming cafes, cosy restos and renowned coffee shops too. 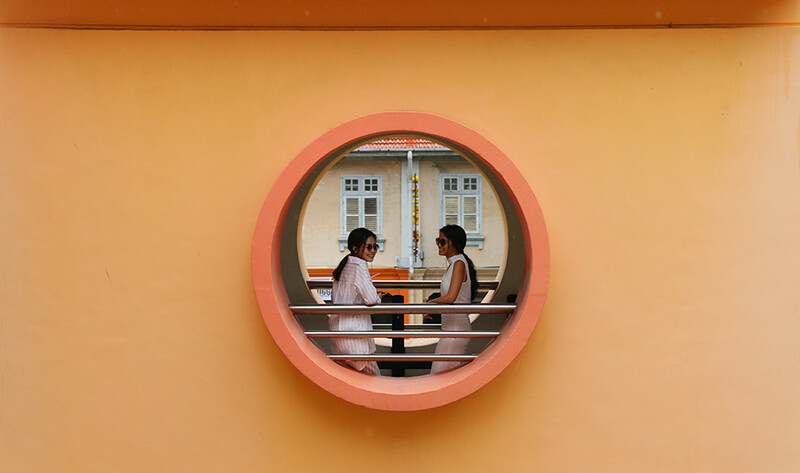 Thanks to its Peranakan history, the area is famous for its colourful shophouses, historical landmarks and, of course, photo-worthy architecture. 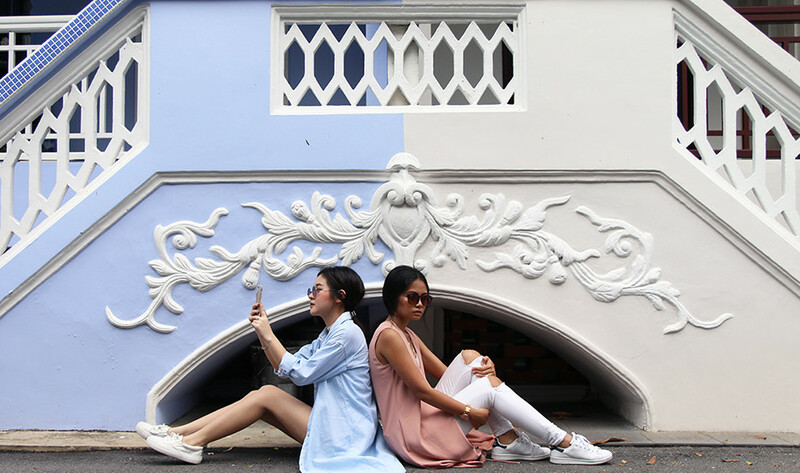 Start taking notes – we explore 10 of Joo Chiat’s most photographic spots. At the cul-de-sac of 150 East Coast Road (opposite Tembeling Road) lies a row of conserved terrace houses painted in the prettiest of pastels. Owing to its former location near the sea, these houses appear to be propped up on ‘stilts’, a necessary design feature to prevent the high tea from seeping in. 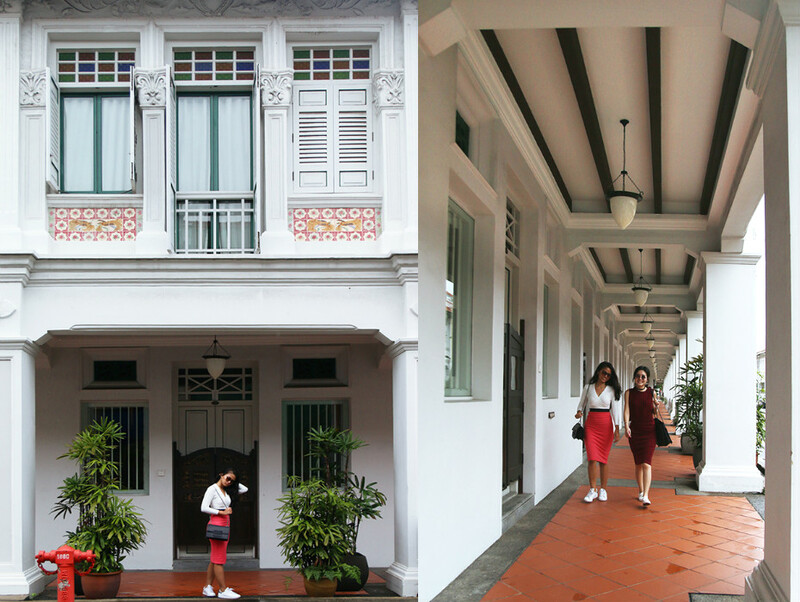 Fun fact: These houses are some of the few remaining old houses in Singapore with basements. Getting there: From Eunos MRT station, board bus 966 at the opposite bus stop. Alight at Opposite Block 72 eight stops later and walk to this stretch of houses. 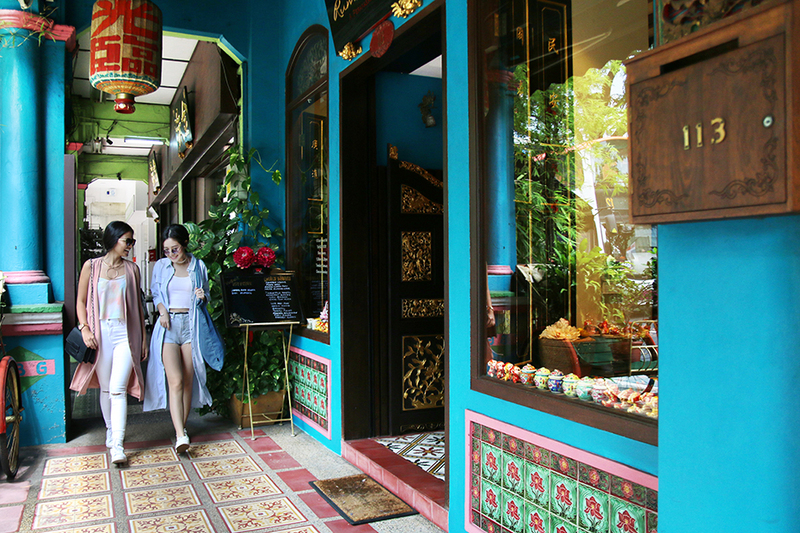 Just across the street from 112 Katong is Rumah Bebe, a purveyor of all things Peranakan, including gorgeous traditional Nyonya kebayas and beautiful beaded slippers. Do note that while photography is strictly not allowed within the store, the exteriors are still worth snapping, thanks to the striking cerulean facade and Peranakan tiled flooring of its shopfront. 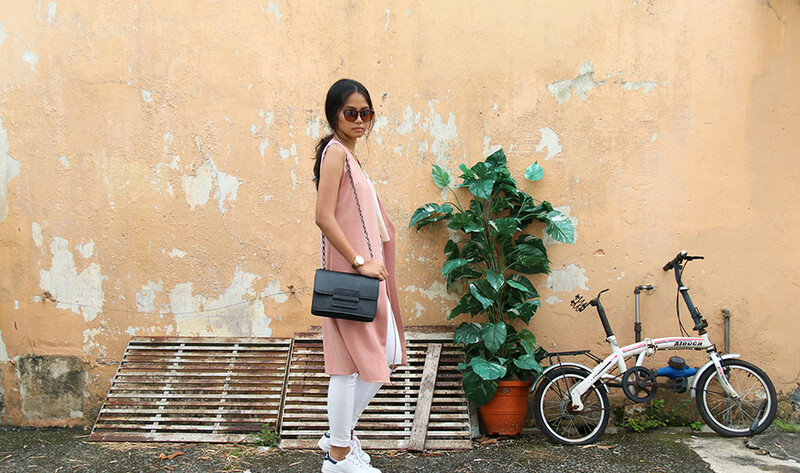 Getting there: Rumah Bebe is located at 113 East Coast Road. From Dakota MRT station, walk to the bus stop at Block 99, Old Airport Road. Board bus 16 or 33 and alight at Parkway Hotel, Joo Chiat Road, five stops later. Truth: This was our backup plan after realising that our initial destination of the heritage Victorian bungalow at 25 Still Road South is now a pre-school. It worked out for the better, as we stumbled upon a charming back alley painted in bright colours and chock-full of perfectly chipped pastel walls. Getting there: Board bus 13 from Eunos MRT station and alight at After Grand Hotel, four stops later. Walk to 272 East Coast Road. 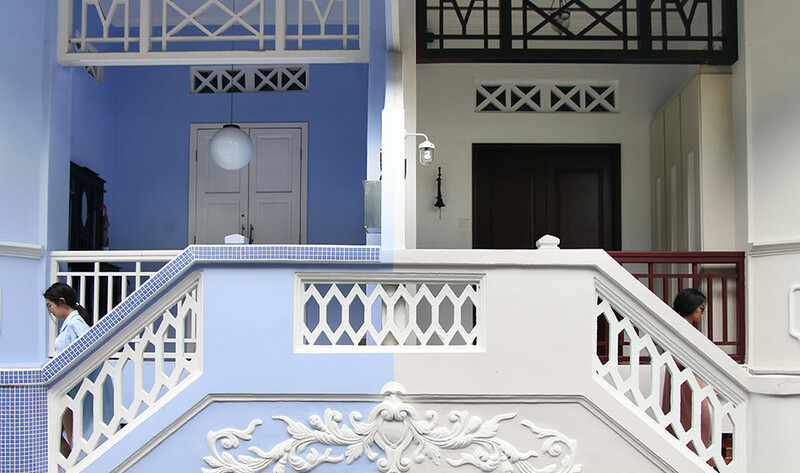 Befitting its Peranakan surrounds, the bulk of Santa Grand Hotel East Coast is housed in a conserved shophouse. But it’s the side exterior of the building that’s gotten minimalists intrigued; the sleek, modern lines and deep grey juxtaposes its primarily heritage front. Getting there: The hotel is located at 30 Eunos Crescent. From Eunos MRT station, board bus 966 at the opposite bus stop. Alight at Opposite Block 72 eight stops later and walk to the hotel. We can’t decide what we love more about this landmark: its bold, crimson exterior or interesting history. 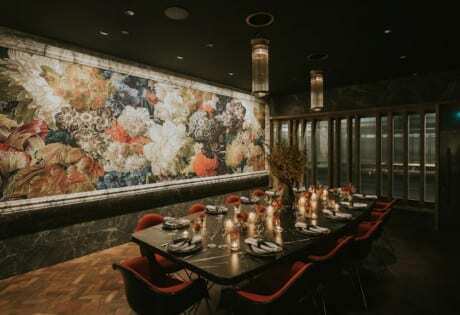 This iconic landmark was once home to the former Katong Bakery & Confectionery, also known as the first to introduce three-tier Western-style wedding cakes in the 1920s. After a decade of closure, the recently reopened building is now home to Birds of Paradise Gelato Boutique, WangCafe and an up-and-coming gallery. Getting there: The Red House at Katong is located at 63 East Coast Road. From Eunos MRT station, board bus 966 at the opposite bus stop. Alight at Opposite Parkway Parade seven stops later and walk to the Red House. 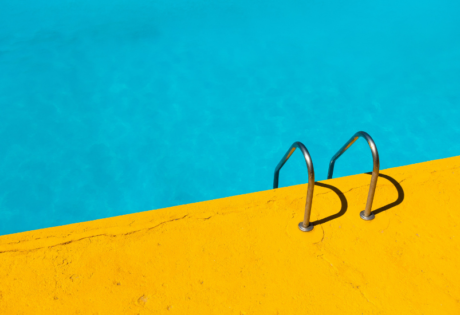 This one’s for the colour-inclined. 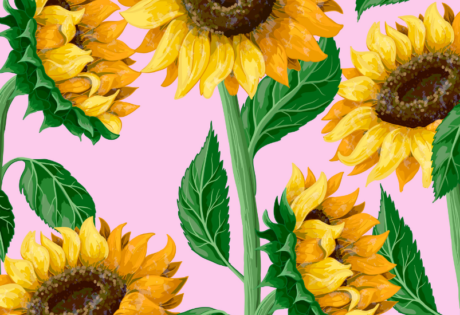 Its facade – painted in creams, pastel oranges, yellows and pinks – makes for cheery backdrops. The abundance of geometrical features (circular windows above) and perfectly aligned angles are also a delight to photograph for symmetry purists. 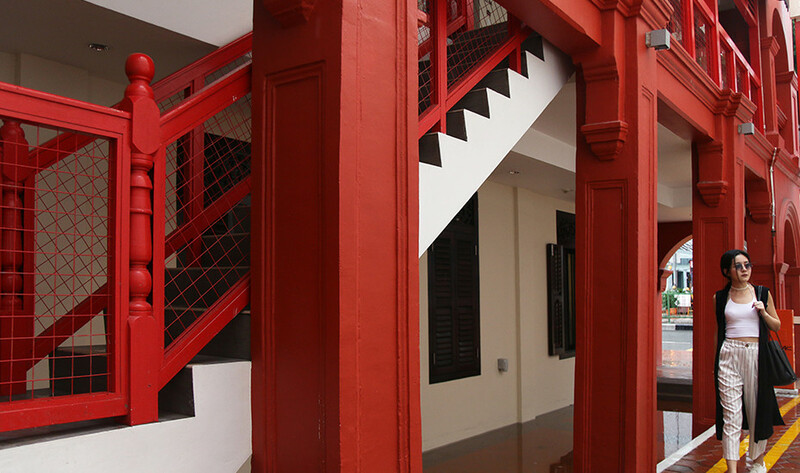 Getting there: Joo Chiat Community Club is located at 30 Eunos Crescent. Alight at Dakota MRT station and board bus 16 from Block 99, Old Airport Road. Alight four stops later at After Duku Road, and walk to Joo Chiat Community Club. No Joo Chiat article is complete without a mention of these renowned shophouses along Koon Seng Road. 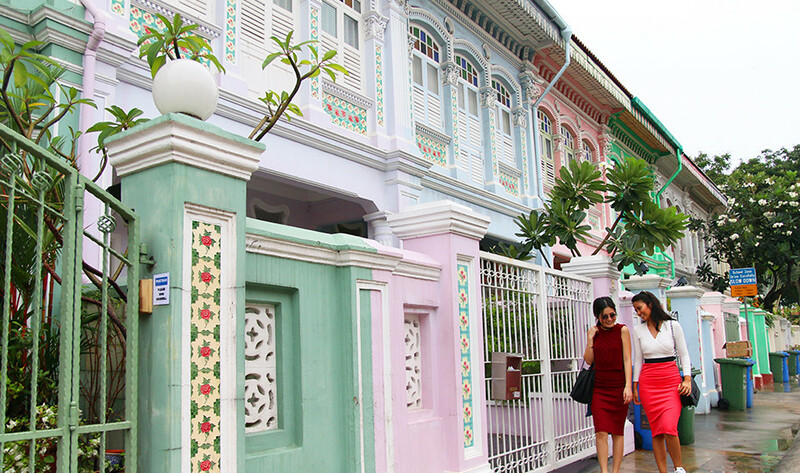 Narrow and tall, these houses are adorned with the signature ceramic Peranakan floral or geometrical tiles and pastel faces. Look out for the Chinese couplets below the windows – these motifs are thought to bring good fortune. Getting there: From Dakota MRT station, walk to the bus stop at Block 99, Old Airport Road. Board bus 33 and alight at Flora East, Joo Chiat Place, seven stops later. Walk to Koon Seng Road. 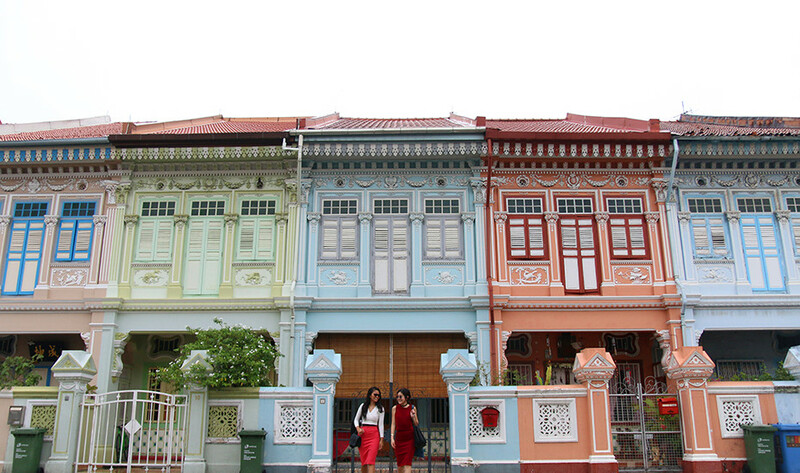 Bring a wide-angle lens if you're shooting with a DSLR - it's easier to snap two contrasting-coloured shophouses at once. 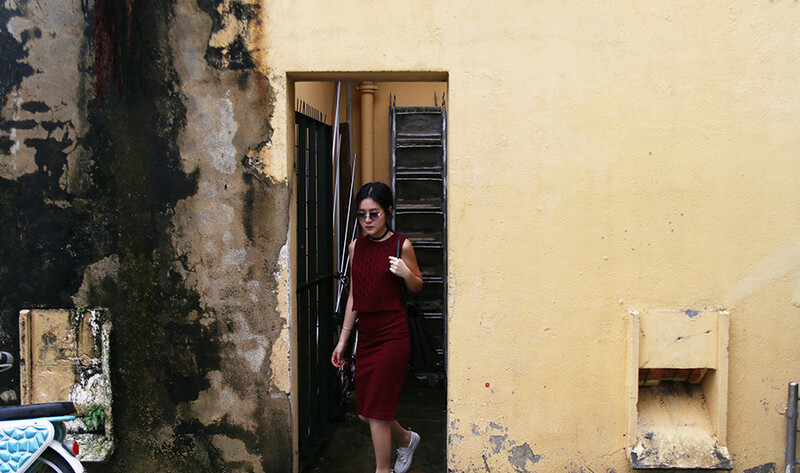 This description may be a little vague, but we promise a walk down Joo Chiat Road’s back alleys will be a fruitful one. Spiral staircases (we recommend looking up its role in night soil collection for a quick and fascinating history lesson) form the frame of the back of these multi-coloured shophouses. Chipped paint jobs and rustic finished walls hint at the neighbourhood’s gritty past. Getting there: From Dakota MRT station, walk to the bus stop at Block 99, Old Airport Road. Board buses 16 or 33 and alight at the bus stop Opposite Maranatha Hall, Dunman Road, three stops later. Walk to Joo Chiat Road. This award-winning stretch of 18 conserved shophouses is hard to miss. The residential enclave boasts a gorgeous white facade with green windows, swinging doors with intricate wooden carvings and pastel tiles on the exterior of its second floor. 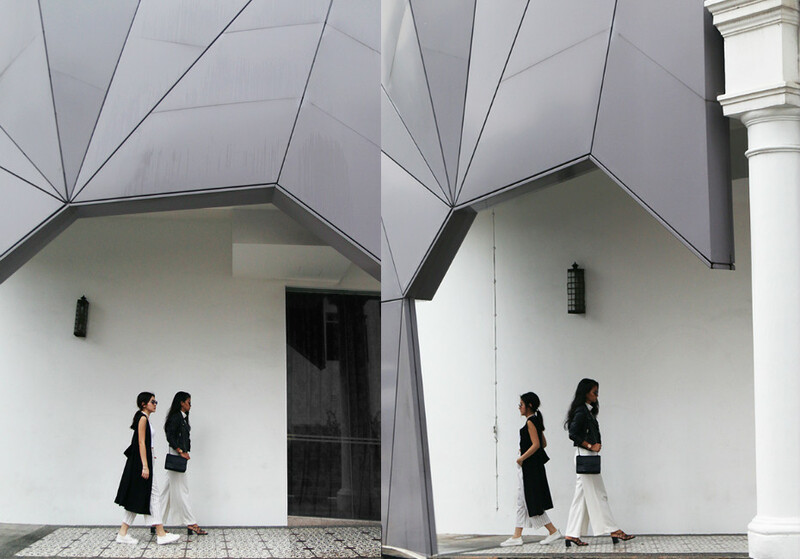 Getting there: Lotus @ Joo Chiat is located at 11 Everitt Road. Alight at Eunos MRT and take Exit C. Board either of these buses: 21, 51, 60, 61, 63, 93, 94, 63M and alight at the next stop. Lotus @ Joo Chiat is accessible via a five-minute walk. This street art mural is an unexpected find in the sleepy Joo Chiat Terrace ‘hood. Painted by Ernest Zacharevic (a Penang-based artist often described as a Malaysian Banksy), the mural features two boys on doodled horses and on the verge of a paint war. Getting here: The Jousting Painters is located at the intersection between Joo Chiat Terrace and Everitt Road. From Eunos MRT station, take Exit A and head to the bus stop After GE Life Centre, Changi Road. Hop on either of these buses: 2, 7, 13, 21, 24, 26, 28, 30, 51, 67, 155. Alight a stop later and walk to Joo Chiat Terrace.